Taking a decade-by-decade approach to the Texas A&M University football tradition, this collection brings together over 40 stories from the most outstanding voices of the program. The spirit of A&M football is not captured by just one phrase, one season, or one particular game; instead, the student-athletes and coaches who made the magic happen over the decades blend their experiences to capture the true essence of their beloved school. Aggies fans will relish the intimate stories told by the figures they have come to cherish. Rusty Burson is the associate editor of 12th Man Magazine and a vice president with the 12th Man Foundation. He is the author of nearly ten books. Cathy Capps is the director of the Lettermen's Association and curator for the Sports Museum at Texas A&M. They both live in College Station, Texas. John David Crow is a former halfback who played for the National Football League's Chicago Cardinals and San Francisco 49ers, and for Texas A&M University. During his college career, he was awarded the Heisman Trophy and later inducted to the College Football Hall of Fame. He lives in College Station, Texas. Taking a decade-by-decade approach to the University of Michigan football tradition, this collection brings together over 40 stories from the most outstanding voices of the program. The spirit of Wolverines football is not captured by just one phrase, one season, or one particular game; instead, the student-athletes and coaches who made the magic happen over the decades blend their experiences to capture the true essence of their beloved school. Michigan fans will relish the intimate stories told by the figures they have come to cherish. Taking a decade-by-decade approach to the Auburn University football tradition, this collection brings together over 40 stories from the most outstanding voices of the program. The spirit of Tigers football is not captured by just one phrase, one season, or one particular game; instead, the student-athletes and coaches who made the magic happen over the decades blend their experiences to capture the true essence of their beloved school. Auburn fans will relish the intimate stories told by the figures they have come to cherish. Taking a decade-by-decade approach to the University of Alabama football tradition, this collection brings together over 40 stories from the most outstanding voices of the program. The spirit of Crimson Tide football is not captured by just one phrase, one season, or one particular game; instead, the student-athletes and coaches who made the magic happen over the decades blend their experiences to capture the true essence of their beloved school. 'Bama fans will relish the intimate stories told by the figures they have come to cherish. 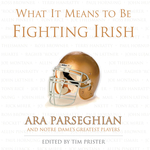 Taking a decade-by-decade approach to the University of Notre Dame football tradition, this collection brings together over 40 stories from the most outstanding voices of the program. The spirit of Fighting Irish football is not captured by just one phrase, one season, or one particular game; instead, the student-athletes and coaches who made the magic happen over the decades blend their experiences to capture the true essence of their beloved school. Notre Dame fans will relish the intimate stories told by the figures they have come to cherish. Taking a decade-by-decade approach to the Florida State University football tradition, this collection brings together over 40 stories from the most outstanding voices of the program. The spirit of Seminoles football is not captured by just one phrase, one season, or one particular game; instead, the student-athletes and coaches who made the magic happen over the decades blend their experiences to capture the true essence of their beloved school. FSU fans will relish the intimate stories told by the figures they have come to cherish. Taking a decade-by-decade approach to the University of Southern California football tradition, this collection brings together over 40 stories from the most outstanding voices of the program. The spirit of Trojan football is not captured by just one phrase, one season, or one particular game; instead, the student-athletes and coaches who made the magic happen over the decades blend their experiences to capture the true essence of their beloved school. USC fans will relish the intimate stories told by the figures they have come to cherish. Taking a decade-by-decade approach to the University of Wisconsin football tradition, this collection brings together over 40 stories from the most outstanding voices of the program. The spirit of Badger football is not captured by just one phrase, one season, or one particular game; instead, the student-athletes and coaches who made the magic happen over six decades blend their experiences to capture the true essence of their beloved school. From Pat Richter looking back on a career that included one of history’s greatest Rose Bowls and Al Toon talking about playing for Dave McClain, to Joe Rudolph remembering the rebirth of UW football under Barry Alvarez and Brett Bielema sharing his passion for coaching, Wisconsin fans will relish the intimate stories told by the figures they have come to cherish. Taking a decade-by-decade approach to the Ohio State University football tradition, this collection brings together over 40 stories from the most outstanding voices of the program. The spirit of Buckeyes football is not captured by just one phrase, one season, or one particular game; instead, the student-athletes and coaches who made the magic happen over eight decades blend their experiences to capture the true essence of their beloved school. From Howard "Hopalong" Cassady and Chris Spielman to Cris Carter and the players who helped win the 2002 National Championship, Ohio State fans will relish the intimate stories told by the figures they have come to cherish. Taking a decade-by-decade approach to the Brigham Young University football tradition, this collection brings together over 40 stories from the most outstanding voices of the program. The spirit of Cougars football is not captured by just one phrase, one season, or one particular game; instead, the student-athletes and coaches who made the magic happen over the decades blend their experiences to capture the true essence of their beloved school. BYU fans will relish the intimate stories told by the figures they have come to cherish. Taking a decade-by-decade approach to the Detroit Red Wings hockey tradition, this collection brings together over 40 stories from the most outstanding voices of the team. The spirit of the Red Wings is not captured by just one phrase, one season, or one particular game; instead, the players and managers who made the magic happen over the decades blend their experiences to capture the true essence of their beloved team. Wings fans will relish the intimate stories told by the figures they have come to cherish. Taking a decade-by-decade approach to the University of North Carolina basketball tradition, this collection brings together over 40 stories from the most outstanding voices of the program. The spirit of Tar Heels basketball is not captured by just one phrase, one season, or one particular game; instead, the student-athletes and coaches who made the magic happen over the decades blend their experiences to capture the true essence of their beloved school. Tar Heels fans will relish the intimate stories told by the figures they have come to cherish. Taking a decade-by-decade approach to the University of Tennessee football tradition, this collection brings together over 40 stories from the most outstanding voices of the program. The spirit of Volunteers football is not captured by just one phrase, one season, or one particular game; instead, the student-athletes and coaches who made the magic happen over the decades blend their experiences to capture the true essence of their beloved school. Vols fans will relish the intimate stories told by the figures they have come to cherish. Taking a decade-by-decade approach to the Louisiana State University football tradition, this collection brings together over 40 stories from the most outstanding voices of the program. The spirit of Tigers football is not captured by just one phrase, one season, or one particular game; instead, the student-athletes and coaches who made the magic happen over the decades blend their experiences to capture the true essence of their beloved school. LSU fans will relish the intimate stories told by the figures they have come to cherish. Taking a decade-by-decade approach to the University of Florida football tradition, this collection brings together over 40 stories from the most outstanding voices of the program. The spirit of Gators football is not captured by just one phrase, one season, or one particular game; instead, the student-athletes and coaches who made the magic happen over the decades blend their experiences to capture the true essence of their beloved school. From Danny Wuerfful and the shotgun formation in the Sugar Bowl to Tim Tebow and his transition to a full-time starter as a sophomore, Florida fans will relish the intimate stories told by the figures they have come to cherish. Taking a decade-by-decade approach to the University of Nebraska football tradition, this collection brings together over 40 stories from the most outstanding voices of the program. The spirit of Cornhusker football is not captured by just one phrase, one season, or one particular game; instead, the student-athletes and coaches who made the magic happen over the decades blend their experiences to capture the true essence of their beloved school. 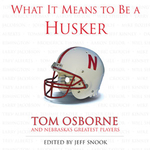 Nebraksa "Husker" fans will relish the intimate stories told by the figures they have come to cherish. Taking a decade-by-decade approach to the University of Oklahoma football tradition, this collection brings together over 40 stories from the most outstanding voices of the program. The spirit of Sooners football is not captured by just one phrase, one season, or one particular game; instead, the student-athletes and coaches who made the magic happen over the decades blend their experiences to capture the true essence of their beloved school. Sooners fans will relish the intimate stories told by the figures they have come to cherish. Taking a decade-by-decade approach to the Chicago Cubs baseball tradition, this collection brings together over 40 stories from the most outstanding voices of the team. The spirit of Cubs baseball is not captured by just one phrase, one season, or one particular game; instead, the players and managers who made the magic happen over the decades blend their experiences to capture the true essence of their beloved team. Cubs fans will relish the intimate stories told by the figures they have come to cherish. Taking a decade-by-decade approach to the Chicago White Sox baseball tradition, this collection brings together over 40 stories from the most outstanding voices of the team. The spirit of White Sox baseball is not captured by just one phrase, one season, or one particular game; instead, the players and managers who made the magic happen over the decades blend their experiences to capture the true essence of their beloved team. Sox fans will relish the intimate stories told by the figures they have come to cherish. Taking a decade-by-decade approach to the University of Georgia football tradition, this collection brings together over 40 stories from the most outstanding voices of the program. 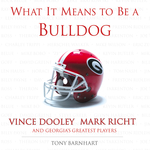 The spirit of Bulldogs football is not captured by just one phrase, one season, or one particular game; instead, the student-athletes and coaches who made the magic happen over eight decades blend their experiences to capture the true essence of their beloved school. University of Georgia fans will relish the intimate stories told by the figures they have come to cherish. Taking a decade-by-decade approach to the athletics tradition of the University of Kansas, this collection brings together over 40 stories from the most outstanding voices of the program. The spirit of Jayhawks sports is not captured by just one phrase, one season, or one particular game; instead, the student-athletes and coaches who made the magic happen over the decades blend their experiences to capture the true essence of their beloved school. KU fans will relish the intimate stories told by the figures they have come to cherish. What It Means to be a Nittany Lion: Joe Paterno and Penn State's Greatest Players explores what seems to be a simple question: What does it mean to be a Nittany Lion? One person or one phrase cannot answer that question because so many emotions encompass the true Nittany Lion spirit. The greatest Penn State players and coaches from the past eight decades were called upon to express why they are so proud to be a part of the storied tradition that is Nittany Lion football and give fans an inside look on their college careers at Happy Valley. What It Means to be a Nittany Lion brings together all of their stories, as told by the most outstanding voices of the Penn State program, guaranteed to enhance your passion for Nittany Lion football. It’s not just one tradition, one season or one particular game—it’s the stories coming from the players who experienced the magic over the decades that capture the true essence of the Nittany Lion way. Examining a simple question—What is so special about Ohio State football?—this book provides a forum for the school’s greatest players and coaches from the past nine decades to express why they are so proud to be a part of the storied tradition that is Buckeye football. Many players took this unique and exclusive opportunity to set the record straight about a few topics that have never before been addressed, including Rex Kern revealing what happened in the bitter 1969 defeat to Michigan, Chris Spielman explaining why he almost chose Michigan instead of Ohio State, Cornelius Greene talking about the real discomfort behind his ulcers, and Joe Germaine detailing how he gave President Clinton’s Secret Service a scare. From Charlie Ream in the 1930s and Paul Warfield in the 1960s to Urban Meyer’s first days on the job after taking over after the 2011 season, What It Means to Be a Buckeye brings together a who’s who of Ohio State football icons in a fashion that no other book has ever accomplished, making it the ultimate keepsake for any fan of Buckeye football. TexAgs talks to Rusty Burson and Cathy Capps about What It Means to Be an Aggie. The Reporter News takes a look at What It Means to Be an Aggie. In good football seasons and difficult ones, Texas A&M former students and fans flock to College Station from all parts of the state of Texas and beyond to support the home team and to celebrate what it means to be an Aggie. Kyle Field comes alive on game days with more than 80,000 passionate fans representing the nationally famous 12th Man. Aggieland, where camaraderie is coveted, sportsmanship is stressed, booing is discouraged and respect is revered, is a place unlike any other in college football, and what it means to be an Aggie can be as difficult to define as it is to duplicate. 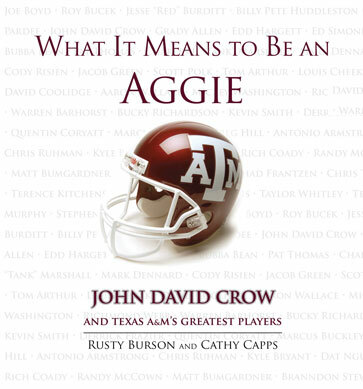 What It Means to be an Aggie: John David Crow and Texas A&M's Greatest Players by Rusty Burson and Cathy Capps explores the phenomenon of being an Aggie. One person or phrase cannot answer that question because so many different emotions encompass the Aggie spirit. What It Means to be an Aggie brings together their stories, as told by the most outstanding voices of the Texas A&M program and guaranteed to enhance your passion for Aggie football. It's not just one tradition, one season or one particular game - it's the stories coming from the players who made the magic happen over the decades that capture the true essence of playing in Aggieland. Rusty Burson is the Associate Editor of 12th Man Magazine and a Vice President with the 12th Man Foundation. He lives in College Station with his wife, Vannessa, and the couple's three children-son, Payton, and daughters, Kyleigh and Summer. This is Burson's eighth book. Cathy Capps is the Director of the Lettermen's Association and Curator for the Sports Museum at Texas A&M. She is a member of the Fightin' Texas Aggie Class of 1985, a second generation Aggie and the mother of two A&M graduates. This is her first book compilation.